Really quickly let me say (and I state this in the video) that I really like TRX Trainers and if you can get one, that’s great. However, cost is an issue for a lot of people, especially right now. I already reviewed other suspension training systems and showed you one homemade version along with an alternate version called the Freestyle Trainer. 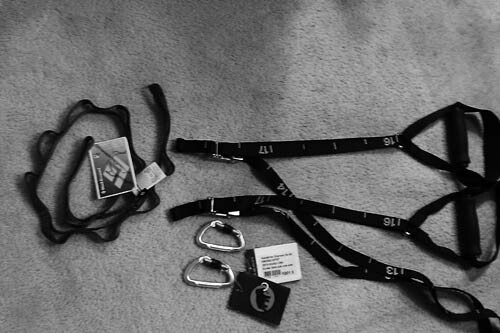 However, some people still wanted to know if they could easily and cheaply (literally) turn their Freestyle Trainer into a carabiner TRX style system. The following is my solution to this problem. Below are links where you can get everything you need. If you want to save a little money in shipping costs, I would check to see what your local outdoor store or rock climbing facilities have available. I literally biked up the street, picked up the materials, and put it together in three minutes tops. Step 1 – Put together your Freestyle Trainer as directed, leaving off the “S” rings at the end. Step 2 – Attach each strap end loop to carabiner #1 and slide to bottom corner. Step 3 – Attach carabiner #1 to the bottom loop of the daisy chain. Step 4 – Attach carabiner #2 to the top loop of the daisy chain. Step 5 – On a pull-up bar (beam, tree, playground equipment, etc.) wrap the daisy chain strap around the bar/limb and connect to one of the loops on the other side. Again, if you can find the last two items locally, you will probably save some cash. I just bought a Freestyle Trainer yesterday for the challenge. This is very cool, I am going to swing by my local sport store after work. The climbing gear was perfect. Have been using this for a few weeks now and it works great. I wasn’t sure about the freestyle vs. the TRX, but I have grown to like it over time. I was trying to figure out how to do this. Much simpler than what I was thinking. How much weight can it support? From the Black Diamond site the Daisy Chain individual loops can take 700 lbf. The main loops are 1000+. IMO it is as sturdy if not sturdier. It has a doublestich in the loops as well versus the single. Do we have to use the screw on carabiner? Great idea regardless, thanks for sharing. No, as I said in the video you don’t have to use it. It’s just my preference. Dude I have been trying to figure out the best way to get mine even on a tree in my back yard. The limb isn’t straight so I am always going though hell adjusting. Thanks Leigh. Oh and for anyone tripping over the excess cords, I just attached this to both of my back straps the inserted the excess back though the slot, it works pretty well. Yeah that is a very positive point of having a connected system. I made one myself from the other video you showed. You can just buy 1 carabiner and 1 lashing strap and you can get the same result instead of using the daisy chain. Use the carabiner as the loop for all three straps, close the new lashing strap around the pullup bar. You can get both at home depot for under $10. If anyone makes their own from scratch I suggest skipping the foot straps and just using the handles as feet straps. 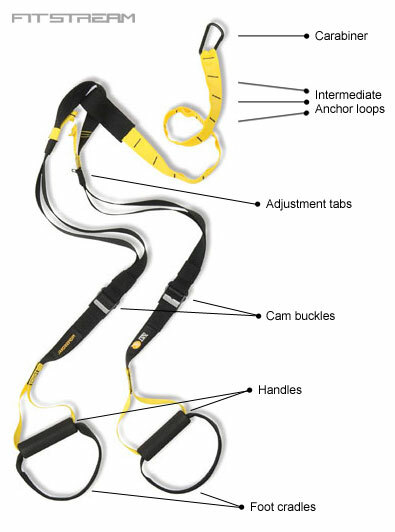 If your really lazy you can just buy 2 lashing straps, 2 pvc pipes, close the loops individually, and you have a suspension systems that’s really similar to the freestyle trainer without tying any knots. I think the point is people didn’t want to go through all that trouble though. You are saying “If really lazy you can do these 10 steps” but what Leigh is showing is how to do it with really really easy material and using an already made trainer. I like the freestyle trainer as is anyway but altering it like this made it a breeze. It took me 2 mins max. I am getting ready to test it out. I will keep you updated! How’s it compare with the DIY version from last time? 1. The quality of the material is better, especially the handles. There is a degree of “you get what you pay for.” Spend an extra 30-40 bucks and I think it makes a difference. This set up is rock solid where as the homemade ones I have played with are a little thin and lack a certain quality to them. 2. It is super super simple to put together. Just order the freestyle trainer, while that is coming go and get your daisy chain/carabiners, and put it together when it arrives. This is also for people who find the other homemade video intimidating. I think it is a good between. Some people really need simple, simple, simple instructions. So this is for them. Great idea. Now what can we use as a door anchor for one of these? Well you can always order a TRX door anchor but I will see what I can come up with. I bought it today. I will let you know what I think. So timely, I’m considering making my own, but may go this route. Leigh, can you compare the difference between having a two-attachment point system (Freestyle Trainer) vs a one-attachment point system (TRX). How does it affect the actual exercises? Does the fact that one has the straps coming straight down and one has the straps at an angle make any difference? Or is it just about setup–one-point attachment is faster. That is cool. Thanks for taking the time to do the video for us, Leigh. Just bought the freestyle trainer today and I do think I will be making some modifications as you suggested. I also am thinking about buying the pull up bar. I can’t do one pull up so maybe that will be some of the incentive. Thanks again for the tips!!! You Rock! Leigh, I love you. I was going to order the FreeStyle Trainer tonight and was doing some last-minute research before the purchase and found this link. I’ve already looked at a carabiner I like at my local Outdoor store. I’m thinking of just looping the FST straps without the S-clips around the doorway bar and then using the carabiner to connect them. Don’t know how well it will work, but will write a follow-up comment once I have all the components here. I will make this a little easier to understand. Step 2. Get the daisy chain and carabiners (shouldn’t cost you more than 30 bucks. Can be as cheap as 15. Step 3. Watch the video and assemble. I made my own system and it works well. I have it set up in my garage. However, my dog has come up to it twice now and peed on it! He never peesin the house and I have no clue why he doesn’t like it. I bought a TRX for my daughter for Christmas and she loves it. I am thinking of buying another system but the TRX is pricey…..so this is a great alternative…and perhaps my dog won’t pee on it! I need help putting my trx style trainer together. It sits down too low. I have it set up until you actually loop it around the pull up bar. When I choose a loop, the trainer sits down too low. Does it matter what side the printed numbers are on?” My setup instructions told me to start with the printed side running through the loops on the spring-loaded lock. But, when I do that, it makes my final step have to be with the numbers on the side of the lock with teeth. Great video! This is probably a dumb question, but curious as to what the difference is between the TRX System and a Freestyle Trainer? Thanks! Freestyle trainer is a separated system, meaning that when it comes as is, it is two separate lines. Think Olympic rings. It provides a different training reaction. In some senses, it is a very small difference. In others, it can be quite larger. The video, shows you how to make it a connected system like the TRX. IN the picture, see the black part in the middle? The two handles/straps are one piece. The freestyle is two full separate lines.